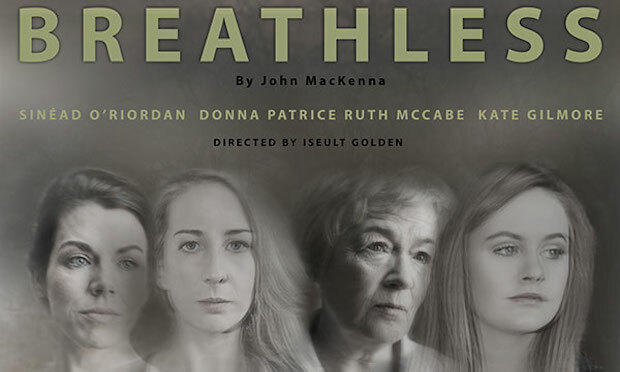 “EVERY pair of shoes takes you on a journey”, utters one of the four female characters in John MacKenna’s Breathless, a play in which four, purgatory dwelling women reveal how they met their fate, while also reminiscing of their previous life on earth. Supported by the women’s fund at the community for Ireland, Breathless focuses on four women from four different social backgrounds: an aging Corkconian (Ruth McCabe), a working class Dub (Kate Gilmore), a midlands tomboy (Donna Patrice) and a reserved, middle class woman (Sinead O’Riordan). Akin to His & Hers, Ken Wardrop’s charming documentary, which chronicled the lives of Irish women of all ages and backgrounds, Breathless, similarly, attempts to portray the life of the average Irish woman with humor and heart, while at the same time giving some detail into the horrific circumstances surrounding their murders and subsequent disappearance. Anchored by a strong, central performance by Ruth McCabe, who effectively acts as a motherly figure to the younger victims, this 90-minute ensemble piece is well paced and well acted. The play’s characters slowly tease out each other’s vulnerabilities and the central action for the characters and, indeed, the audience is finding out who these woman are and how, exactly, they found themselves in purgatory. The space in Smock Alley’s Boy’s School resembles a wasteland. Set designer David Butler makes great use of the natural features of Smock Alley’s Boy’s School, a space that boasts church pews and church window frames. On the floor are a torn and tattered couch, as well as road signs and debris that all point towards a chaotic, post- apocalyptic landscape that is lacking in any natural order. Much of the play’s dialogue centers around arresting stories of miss spent youth, debauchery, first love and sibling relationships, sometimes offering an insight into the lives of the men who defined their lives, not least those men who murdered and disappeared them. Some of the play’s most chilling moments are achieved and accomplished, particularly the descriptions of unspeakably violent acts. Where the play falls down, however, is in moments that feel shoe horned into the play’s narrative for shock value, such as the shared kiss between Ruth McCabe and Sinead O’Riordan’s characters and some of the play’s more “in-yer-face” theater moments, particularly from Donna Patrice’s character. Granted that MacKenna’s Breathless is neither Yeats’ Purgatory nor Beckett’s Waiting for Godot, though it is a welcome continuation of a narrative, both on the stage and in the media, that is focusing on the experiences and sufferings of women in Ireland.